Take a good look at Chris Bourque in his Bruins sweater. Unless some team gets very, very desperate, it’s the last time you’ll see the diminutive left-winger in an NHL jersey. Chris Bourque is a symbol of all that is hopeful and deceptive about our modern culture of celebrity. He’s a small (by NHL standards) man encouraged to hold dreams that were too big. He is, by most accounts, a very nice young man–just what one would expect as the son of NHL Hall of Famer Ray Bourque. The paterfamilias was one of the classiest guys to ever lace on skates–the sort you rooted for even if you weren’t a Bruins fan (which I did, though I’m not!). Ray, who played in the NHL from 1979 to 2011, was an overachiever who used his brain to compensate for a relative lack of physical brawn. In his playing days he was 5’11” and weighed 220 pounds–a bit too much weight that frame. If one of the league’s monsters–a Jagr or a Lemieux, for instance–trapped Ray Bourque in the corner, they could outmuscle him; if one of the speedsters caught him in open ice, they could beat him to the net. The thing was, though, Bourque was so smart that he was almost never caught in the wrong place. When you grow up in La Belle Province (Québec) with an old man like Ray, you’ve got skates on your feet before you can walk. Two of Ray’s sons, Chris and Ryan, have followed NHL dreams, and that path is where the stardust got in their eyes. Not that they shouldn’t try–everybody should give their dreams a test drive, but they should also know when to it’s time to either shift into high gear, or full over to the curb. They should also have an alternative route planned. As it turns out, I’ve seen Chris Bourque play for quite a long time. He’s just 27, but he left Boston University–where I saw him play–after a single season to turn pro. He should have gotten a degree. I have also seen Chris Bourque in parts of seven American Hockey League seasons. He was a very popular player for the Hershey Bears, the farm club of the Washington Capitals. Fans loved him for the same reason they loved him at BU–he can absolutely fly down an open sheet of ice. But, when push meets shove, Bourque has never been able to shove back. That’s because nature cheated him. When the Bruins plucked Bourque from the Capitals in time for this year’s abbreviated season, the Boston media went into hyperbolic overdrive–odd for a guy who, on February 2, scored just his second NHL goal. Bruins fans, of course, wanted Chris to succeed. What could be cooler than having the son of one of the best players in franchise history? And therein lies two problems. The first is the burden of a famous name–one that led a kid to pursue a path whose odds were long instead of having a good backup plan. The odds were long for the second major reason: Chris Bourque is too small to excel in pro hockey. The Boston Globe listed Bourque as 6’ and I want that reporter to be the one pouring the whiskey next time I’m at the bar! Bourque is a generous 5’8” and looks to be less than his stated 180 pounds. What I saw in the AHL was a guy with speed who got pummeled all over the ice. Give CB some space, and he could bury the puck, but professional defensemen (like his old man) are trained not to allow a lot of space on the ice. Today’s NHL is much bigger than it was even in Ray’s time; goal scoring is more a matter of muscle-and-grind than 40-foot slap shots. When I watched Bourque at Hershey, I was baffled by the fan love. He was frequently outmuscled that, were I the coach, he’d have been a fourth liner, if he played at all. If you play on the wing, you have two major jobs: keep opposing wingers from going past you–which he had trouble doing–and scoring. Bourque’s best AHL season was last year, at Hershey, where he scored 27 goals against players mostly less experienced than he. Put another way, he’s no Martin St. Louis, who is the same size, but with the upper body strength to routinely score 30+ goals per season in the NHL, not the minor leagues. What the Bruins saw in Chris Bourque confounds all logic. 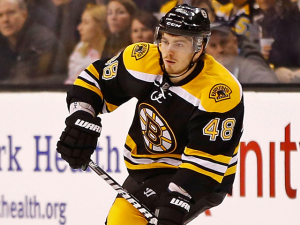 On March 1, the boom lowered, and Chris Bourque was placed on waivers. He went unclaimed and is now toiling for still another AHL team: the Providence Bruins. It’s hard to imagine that he’ll get another shot at the NHL. So, at age 27, what does one do? Bourque might be an AHL roster filler for another year or two, or maybe he can catch on with a Swiss or Russian team for a time, but then what? The Bruins foolishly gave him a two-year $1.1 million contract, but only part of that is guaranteed if he doesn’t make it back to the NHL. I hope Bourque invests well–like in completing his education. His hockey career has been stardust, not stardom. And I hope his 5’9” younger brother Ryan has been paying attention. This blog seldom runs academic reviews, but given Sylvia Burwell's nomination for OMB, this is timely. Walmart is a company Americans either love or hate. Nelson Lichtenstein’s updated exposé gives considerably more rationale for loathing. His is such a damning portrayal that it ventures onto terrain generally reserved for conspiracy theorists. There’s an important difference, though–Lichtenstein’s evisceration is based on reams of evidence, not preference. The story of Sam Walton’s enterprise is steeped in folksy creation myths as spurious as that of Abner Doubleday’s invention of baseball. 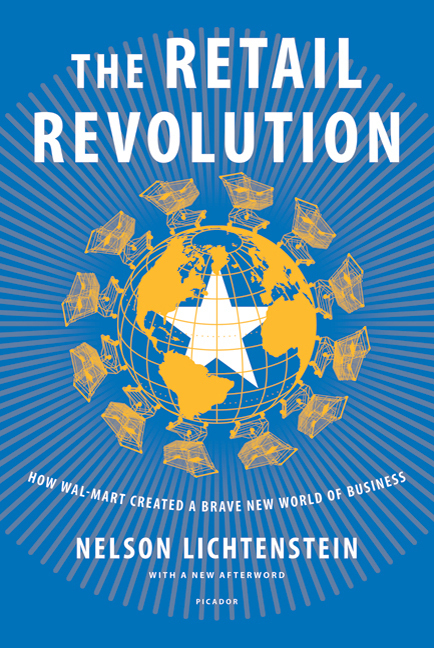 Walmart has been, from the start, a blend of innovation and reactionary politics. Walton was, indeed, a small-town Arkansas boy, but one more akin to the 1920s moralists that precipitated the Scopes Trial. He was an evangelical Christian who loathed urbanites and was stirred by an autocratic desire to Bentonville the planet. Lichtenstein gives grudging admiration for Walton’s business acumen and credits him for revolutionizing retail logistics, but he insists that we also see Walton as a right-winger obsessed with routing demons he felt imperiled his world: unions, liberals, grassroots democracy, cities, and regulatory government. When Walmart left its Ozarks birthplace in Bentonville, Arkansas, it spread to towns of under 10,000 before tackling urban areas with restorative and proselytizing zeal. Even though it has integrated its operations with China’s manufacturing sector, Walmart’s unchanged goal is to make the world like Bentonville, not promote global understanding. As Lichtenstein notes, the company’s team-building rituals and customer loyalty programs retain an evangelical flair that smacks of cultism. Lichtenstein raises bigger questions. If Walmart is the modern-day equivalent of Frank Norris’s Octopus, how did it get that way, and how did it build such a loyal following? Walton’s fixation on low costs is a standard feature of capitalism; in that regard, Bentonville is little different from past Yankee traders, southern plantation owners, or cut-rate retailers such as Butler Brothers, Mammoth Mart, or K-Mart. It took the stagflation of the 1970s and the anti-worker policies of the 1980s for Walton to put bigger plans in motion. Give Walton credit; he was “in love with logistics” (47) and understood how the humble bar code could restructure business. As one executive put it, Walmart became more of “distribution business” than a retailer. (48) It eliminated wholesalers and replaced them with a supply chain that directly tied manufacturers to distribution centers–not supply and demand, rather “supply and command.” (69) The rising empire was sustained through a “corporate culture” built upon “family, faith, and small-town sentimentality that coexists… with a world of transnational commerce, employment insecurity and poverty-level wages.” (70) It also has “more sticks than carrots,” (102) perfect for rooting out deviation or disloyalty. Lichtenstein echoes critics such as Robert Greenwald and Charles Fishman, who also reveal that Walmart’s retail model rests upon the necessity of bending vendors to its will, even if vendors go bankrupt in the process. It is equally imperative that wages be kept low. There are few tricks Walmart hasn’t used, or labor laws it hasn’t violated. It also uses propaganda to convince employees of company benevolence, despite overwhelming evidence to the contrary. It touts endless “opportunities” for “associates,” though almost none attain them. Turnover is both expected and preferred. And heaven help the manager deemed too generous with his–almost always “his”–associates. External enemies help, and Walmart slanders labor unions in ways that make mockery of the Wagner Act. The firm spends little on employees, but it spends a fortune to keep unions at bay. Does Walmart create jobs? Yes and no. In many states, Walmart’s low wages take more out economies–in uninsured health costs and public services–than it adds in wages or taxes. It gets way with this because it uses “its size and sophistication to leverage its political influence” (268). Walmart is fond of far-right officials, but it has also had the Clintons in its hip pocket. Mostly it uses its octopus-like might to decimate competition, from mom-and-pop stores to grocery chains. It manipulates sales taxes, gets sweetheart property tax deals, uses “self-interested philanthropy” (277), and drives its trucks through every regulatory loophole opened since the 1980s. Any cause for optimism? Refreshingly, Lichtenstein does not attack consumerism. As he puts it, there’s nothing inherently wrong with stuffing one’s house with a “a bunch of inexpensive stuff.” (338) Instead, Lichtenstein thinks Walmart is on the cusp of imperial overreach. It hasn’t done well in Europe–and pulled out of Germany altogether–and has faced stiff opposition in North America. It wins far more battles than it loses, but the campaigns take a toll. Ironically, it also faces competition from others that followed suit and likewise “churn their workforce, whipsaw their vendors, and have turned retirement pay and health provisions into a financial lottery for millions of workers.” (339) Those very millions make the Walmart model unsustainable in the long run. One employer notes that paying higher wages isn’t “altruism. It is good business.” (336) It doesn’t matter how low your prices are if nobody has the money to buy your products. The wildcard, Lichtenstein notes, is not labor unions–the United Food and Commercial Workers has pretty much surrendered–but politics. He’s open to the charge of being naive in trusting modern Democrats to smack down Walmart*, but he’s probably right that structural adjustment and new ground rules are inevitable. In essence, the retail revolutionaries must pay the hidden costs they have incurred, or the lights will go out–even in Bentonville. *Lichtenstein wrote this book long before the emergence of Sylvia Burwell as OMB nominee. One suspects he'd dial back some of this optimism. Walmart's Hand on the US Budget: Thanks (for nothing) Barack!